All Gold only uses mouth watering ripe melons along with a hint of ginger to give this jam a little flavour kick and distinctive zing. 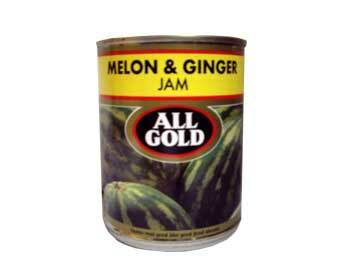 Melon (minimum 35%), Cane Sugar, Glucose, Pectin (E440), Flavouring, Spices, Anti-foaming Agent. The very best jam on the market - nothing can compare with it - really great with cheese.